Papua New Guinea is a country not well known in the United States, and if we know anything about Papua New Guinea, it is too often a false idea gained from the pictures of heathen tribal life with painted faces and primitive dances. What is not well known about Papua New Guinea is that life is civilized (although definitely still in the “developing country” category), the people are very friendly, and there is an abundance of fruits and vegetables. Also, many of the people know a little English to communicate. While this is a pleasant surprise, the country itself (anywhere outside the capital of Port Moresby) is very isolated from the rest of the world. Internet service is almost nonexistent. Cell phones, while abundant, work only within the country. To give you an idea of the isolation, I could not even find a post card to buy, not even at the post office in Kimbe, the largest town on the island of New Britain. Brother Gideon on the left and Brother Samuel Taugai . John Wolff also provides funds to send a worker from Australia, New Zealand or the United States from time to time, to teach and preach for the Lay Members Association. In May and June of 2012, it was my privilege to be sent on such a mission trip to the village of Buvussi on the island of New Britain, where a school was being held for Bible workers mainly from the island, but also from three other parts of Papua New Guinea. There were about 25 students. I taught subjects on the Godhead, Daniel and Revelation, the gospel and other Bible doctrines in the second phase of their school. Earlier, Brother Manasseh from Fiji had come for the first phase of the training school and taught nutritional cooking, anatomy and physiology and medical missionary work. The Lord blessed the classes, which will help to keep His people in the unity of present truth. 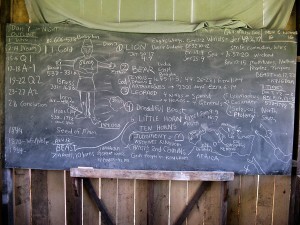 The evenings were spent viewing a PowerPoint program that often reviewed the lessons of the day. I reaped the great benefits of Brother Manasseh’s tutelage in the excellent meals that I enjoyed there. Food items included three varieties of taro, plantain, bananas, pit pit (the edible stalk of a wild cane), cassava, greens (four varieties, including ferns), papaya, rice, potatoes and a nice tomato and garlic sauce. Fresh water for bathing and drinking was gained from a three-mile walk to and from a local gushing spring. Chalk board notes and illustrations on Daniel 7. I visited five other church companies on the island—Tamba, Isali, Tiaru, Vilelo and Barema, where I presented either a PowerPoint program or talk illustrated on chalk board about the history of the three angels’ messages—showing how God defined the three angels’ messages in history. The people were very grateful to learn how God had led in the origin of the Seventh-day Adventist Church. Because so many Lay Members have come directly from the Sunday-keeping churches into the lay members Association, they were happy and surprised to learn that the Seventh-day Adventist pioneers had come from many Sunday-keeping churches and did not keep the Sabbath as a movement until 1848. My emphasis in the school and churches was that 1) the Seventh-day Adventist Church was raised up by God for one purpose—to give the three angels’ messages; 2) that the Lay Members Association was raised up for the same purpose; and 3) that the true Seventh-day Adventist Church (no matter what its name) is the church that is believing and giving the three angels’ messages of Revelation 14:6-12. The three angels’ messages are to go to every nation, kindred, tongue and people, and the Lay Members Association, in a land of 980 different languages, has been positioned by God to lead out in the world to give the loud cry—a repeat of the three angels’ messages globally with great power. 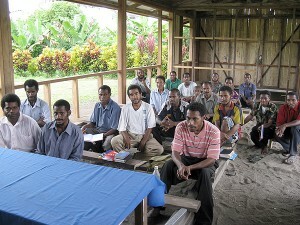 Students in one of the classes. The final week of the trip was a journey to the island of Normanby, where eight Seventh-day Adventist churches had become independent and joined in the work of Laymen Ministries Association under the guidance of Samuel Taugai. We had four days of meetings, which helped to strengthen the members’ decision to stand for the truth and the three angels’ messages. Brother Samuel has also helped to lead four other Pentecostal churches in his area to take a stand on the Sabbath truth! 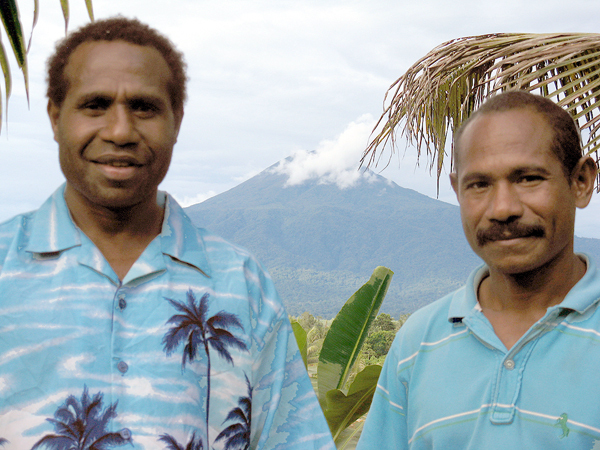 The Bible workers and members of the Lay Members Association of Papua New Guinea greatly need your prayers and financial support. Donations can reach them through John Wolff, 2701 Old Gympie Road, Beerwah, Queensland, Australia 4518. He can be contacted by phone at 617-5484-6547 and by email at johnw@tsn.cc. The 3 Angels Publishing ministry is in need of investors for the second printing of Steps to Christ, and the first printing of The Great Controversy (illustrated). You can contact the ministry by phone: 931-692-1844 or by email at pjones4@hotmail.com for more details. By Patrick Jones, 3 Angels Publishing Ministry.